For smaller kitchens or dining room. 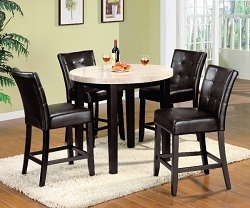 This round marble to counter height table seat 4 comfortably mix with a key hold style padded leatherette chairs. Beautiful inlay of genuine marble give it table a slick contemporary touch. Solid wood, ivory genuine marble top, vinyl seating, finish in dark walnut finish.